"Mister Rogers" redirects here. For the television show, see Mister Rogers' Neighborhood. 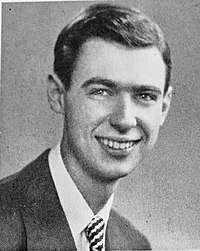 Fred McFeely Rogers (March 20, 1928 – February 27, 2003) was an American television personality, musician, puppeteer, writer, producer, and Presbyterian minister. He was known as the creator, composer, producer, head writer, and host of the preschool television series Mister Rogers' Neighborhood from 1968 until his retirement in 2001. Rogers was not happy with the television shows that children were seeing. He began to write and perform local Pittsburgh-area shows for children. In 1968, Eastern Educational Television Network began nationwide distribution of Rogers's new show on WQED. For thirty years, Rogers became a television icon of children's entertainment and education. Rogers supported many public causes. In the Betamax case, the U.S. Supreme Court used Rogers's testimony before a lower court in favor of fair-use television show recording. Rogers also testified before a U.S. Senate committee to support government funding of children's television. Rogers was honored with the Presidential Medal of Freedom by President George W. Bush, forty honorary degrees, and a Peabody Award. He was added into the Television Hall of Fame. He was listed number 35 of the TV Guide's Fifty Greatest TV Stars of All Time. The Smithsonian Institution has one of his sweaters as a "Treasure of American History". 2.4 Role in Sony Corp. of America v. Universal City Studios, Inc.
Rogers was born in Latrobe, Pennsylvania to James Rogers and Nancy McFeely. His father was a businessman. His mother came from a rich Pittsburgh family and also was a hospital volunteer during and after World War II. His grandfather from his mother's side, Fred McFeely, was the president of McFeely Brick, one of Latrobe’s largest businesses. Rogers grew up in a large brick mansion at 737 Weldon Street in Latrobe. He had an adopted sister, Elaine. Rogers spent much of his free time with his grandfather McFeely, who loved music. Rogers began to play the piano when he was five and sang with his mother. When growing up, Rogers was shy and overweight. He was home schooled many times because of his asthma. Rogers had a hard time making friends and would be bullied many times as a little boy for his weight, often called "Fat Freddy". During his high school years in Latrobe, Rogers became more confident and popular. Rogers was president of the student council, a member of the National Honor Society and was editor-in-chief of the yearbook. He graduated in 1946. He studied at Dartmouth College from 1946 until 1948 and then went on at Rollins College in Winter Park, Florida to earn a B.A. in music composition in 1951. While studying at Rollins, Rogers met Sara Joanne Byrd who was from Oakland, Florida. They were married on June 9, 1952. They had two sons: James, in 1959, and John, in 1961. Rogers graduated from Pittsburgh Theological Seminary and was ordained a minister of the United Presbyterian Church in 1963. Rogers returned to Pittsburgh in the 1960s. Rogers entered seminary after college but wanted to work with television. In an interview with CNN, Rogers said, "I went into television because I hated it so, and I thought there's some way of using this fabulous instrument to nurture those who would watch and listen". He applied for a job at NBC in New York City in 1951. He first worked as an assistant producer, and later as a network floor director on musical programs such as Your Hit Parade, The Kate Smith Hour, and The Voice of Firestone. He also worked on Gabby Hayes's children's show. Rogers left NBC because he did not approve of the agency using children for advertisement. He began working as a puppeteer on the local children's show The Children's Corner for Pittsburgh public television station WQED in 1954. The show won a Sylvania Award for best children's show and was broadcast nationally on NBC. Rogers studied theology at the nearby Pittsburgh Theological Seminary during his lunch breaks. However, he did not want to go into preaching and was told to continue making children's television after his ordination. He worked with the University of Pittsburgh's child development and care program. In 1963, the Canadian Broadcasting Corporation (CBC) hired Rogers to create the 15-minute children's program Misterogers. Rogers moved to Toronto and the series ran for three seasons. Three years later, Rogers moved back to the United States. 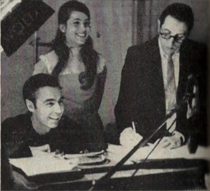 In 1966, Rogers got the rights to his program from the CBC and moved the show to WQED in Pittsburgh, where he had worked on The Children's Corner. Mister Rogers' Neighborhood began in 1968 and ran for 895 episodes. It aired on National Educational Television, which later became The Public Broadcasting Service. The last set of new episodes was taped in December 2000 and began airing in August 2001. By 1985, eight percent of people living in the United States watched the show. The program always started with Rogers coming home, singing his theme song "Won't You Be My Neighbor?". He would then change into sneakers and a zippered cardigan sweater. The sweaters were all knitted by his mother. In his show, Rogers would always go on trips, teach new things and show short movies on "Picture, Picture". Each episode included a trip to Rogers's "Neighborhood of Make-Believe" with a trolley, a castle, and the kingdom's citizens, including King Friday XIII. Rogers always fed his aquarium fish during episodes. He would always say this to his audience he was feeding them because he received a letter from a young blind girl who wanted to know each time he did this. The program would end with Rogers winging "It's Such a Good Feeling". Rogers believed not to act differently when he was being filmed to how he acted normally. He said that "One of the greatest gifts you can give anybody is the gift of your honest self. I also believe that kids can spot a phony a mile away". Rogers wrote almost all of the music on the program. He wanted to teach children to love themselves and others, and he talked about common childhood fears with comforting songs. He once took a trip to a children's hospital to show children that a hospital is not a place to fear. Rogers would talk about social issues on his program including the assassination of Robert F. Kennedy, racism and divorce. One famous episode, Rogers soaked his feet with Officer Clemmons (François Clemmons), who was African-American, in a kiddie pool on a hot day. The scene was a message of inclusion during a time when racial segregation in the United States was common. Rogers was also known for having children with disabilities on his show. In a 1981 episode, Rogers met a young quadriplegic boy, Jeff Erlanger, who showed how his electric wheelchair worked and explained why he needed it. Erlanger and Rogers both sang a duet of the song "It's You I Like". Before the taping, Erlanger had long been a fan of the program, and his parents wrote a letter to Rogers asking if they could meet. "You've made this day a special day, by just your being you. There's no person in the whole world like you; and I like you just the way you are"
Rogers never talked about his religious beliefs on the show because he did not want any viewer to feel ignored from the show. During the Gulf War, he comforted his audience that all children in the neighborhood would be well cared for. Rogers asked parents to promise to take care of their children. "When I was a boy and I would see scary things in the news, my mother would say to me, 'Look for the helpers. You will always find people who are helping.' To this day, especially in times of "disaster," I remember my mother's words and I am always comforted by realizing that there are still so many helpers – so many caring people in this world"
In 1969, Rogers appeared before the United States Senate Subcommittee on Communications. His goal was to ask the Senate to support funding for PBS and the Corporation for Public Broadcasting, because proposed budget cuts. In about six minutes of testimony, Rogers spoke of the need for social and emotional education that public television gave. He argued that other television programming like his Neighborhood helped encourage children to become happy citizens. The chairman of the subcommittee, John O. Pastore, did not know Rogers or his work and was sometimes said to be impatient. However, after Rogers, Pastore said that the testimony had given him goosebumps, and said, "I think it's wonderful. Looks like you just earned the $20 million". The Senate would soon increase PBS funding from $9 million to $22 million. Main article: Sony Corp. of America v. Universal City Studios, Inc.
During the issues of households being able to record television programs with a VCR grew, Rogers was active in supporting VCR companies in court. His 1979 testimony, in the case Sony Corp. of America v. Universal City Studios, Inc., Rogers said he was not against home recordings of his television programs because families could watch them together at a later time. When the case reached the Supreme Court in 1983, the majority decision thought about the testimony Rogers gave. The court found that the Betamax video recorder did not commit copyright violations. The court said that his views were an important piece of evidence "that many [television] producers are willing to allow private time-shifting to continue". In 1978, while taking a break from taping new Neighborhood episodes, Rogers hosted an interview program for adults on PBS called Old Friends...New Friends. On the show, Rogers interviewed "actors, sports stars, politicians, and poets". The show was lasted only 20 episodes. The only time Rogers appeared on television as someone other than himself was in 1996 when he played a preacher on one episode of Dr. Quinn, Medicine Woman. Rogers voiced himself on the "Arthur Meets Mister Rogers" episode of the PBS Kids series Arthur. Rogers had an apartment in New York City and a summer home on Nantucket Island in Massachusetts. Rogers was red–green color blind. He had a healthy lifestyle as he swam every morning and neither smoked nor drank. He was a vegetarian because he believed eating meat was wrong, saying "I don't want to eat anything that has a mother". Despite popular rumors, he never served in the military as a Navy SEAL during the Vietnam War and never had tattoos. In 1991, the Pittsburgh Penguins named Rogers as their celebrity captain, as part of a celebration of the National Hockey League's 75th anniversary. Card No. 297 from the 1992 NHL Platinum collection celebrated the event, making Rogers one of only twelve celebrity captains to be chosen for a sports card. During his morning routine, Rogers would respond to every single fan mail and return them to the respective sender. In 1992, he was awarded the Peabody Award. He was added into the Television Hall of Fame in 1999. In an interview with Rogers' friend William Hirsch, Rogers said that if sexuality was measured on a scale, then: "Well, you know, I must be right smack in the middle. Because I have found women attractive, and I have found men attractive," leading some readers to describe Rogers as bisexual. Rogers was diagnosed with stomach cancer in December 2002, not long after his retirement. He had surgery on January 6, 2003, which was unsuccessful. A week earlier, he was grand marshal of the Tournament of Roses Parade, with Art Linkletter and Bill Cosby. Rogers died on the morning of February 27, 2003 after slipping into a coma, at his home in Pittsburgh. His wife was by his side when he died. He died less than a month before he would have turned 75. More than 2,700 people went to his memorial service at Heinz Hall. Honorary guests included former Good Morning America host David Hartman, Teresa Heinz Kerry, philanthropist Elsie Hillman, PBS President Pat Mitchell, Arthur creator Marc Brown, and The Very Hungry Caterpillar author-illustrator Eric Carle. Speakers remembered Rogers for his love of children, devotion to his religion, love for music, and humor. Teresa Heinz Kerry said of Rogers, "He never condescended, just invited us into his conversation. He spoke to us as the people we were, not as the people others wished we were". Rogers is buried at Unity Cemetery in Latrobe. 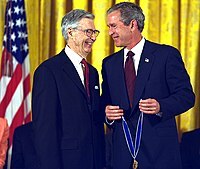 President George W. Bush awarded Rogers the Presidential Medal of Freedom in 2002 for his works to children's education. He said that "Fred Rogers has proven that television can soothe the soul and nurture the spirit and teach the very young". In 2003, the United States Senate passed Resolution 16 to celebrate the life of Rogers. Following Rogers' death, the U.S. House of Representatives in 2003 passed Resolution 111 honoring Rogers for "his legendary service to the improvement of the lives of children, his steadfast commitment to demonstrating the power of compassion, and his dedication to spreading kindness through example". On New Year's Day 2004, Michael Keaton, who worked on stage on Mister Rogers' Neighborhood before becoming an actor, hosted the PBS TV special Fred Rogers: America's Favorite Neighbor. His hometown of Latrobe and Pittsburgh host "Won't You Wear a Sweater Day" to honor Rogers. The event takes place annually on his birth date, March 20. In 2003, the asteroid 26858 Misterrogers was named after Rogers by the International Astronomical Union. One of Rogers' famous sweaters was bought by the Smithsonian Institution, which has it shown on their "Treasure of American History" exhibit. The Fred Rogers Memorial Statue in Pittsburgh was dedicated in 2009. On June 25, 2016, the Fred Rogers Historical Marker was placed near Latrobe, Pennsylvania in his memory. In January 2018, it was announced that Tom Hanks would play Rogers in a movie based on his later life titled A Beautiful Day in the Neighborhood (2019) directed by Marielle Heller. In June 2018, the documentary Won't You Be My Neighbor? based on the life and legacy of Rogers, was released to positive reviews and became the highest money making biography-documentary (biodioc) of all time. Rogers was honored on a special United States postage stamp in March 2018. On September 21, 2018, Google Doodle honored him with a stop-motion video of Mister Rogers' Neighborhood. On October 23, 2018, during the first game of the 2018 World Series, Rogers's first television commercial aired for Google's Pixel 3 smartphone. In the ad, Rogers sings "Did You Know" which is the first time his voice or images has been used in a commercial for a product on television. ↑ Jackson, K.M. ; Emmanuel, S.M. (2016). Revisiting Mister Rogers' Neighborhood: Essays on Lessons About Self and Community. McFarland, Incorporated, Publishers. p. 27. ISBN 978-0-7864-7296-3. Retrieved 2018-10-31. ↑ 4.0 4.1 4.2 4.3 4.4 4.5 4.6 "Early Life". Fred Rogers Center for Early Learning & Children's Media. Retrieved 2018-10-30. ↑ 5.0 5.1 King, M. (2018). The Good Neighbor: The Life and Work of Fred Rogers. ABRAMS. ISBN 978-1-68335-349-2. Retrieved 2018-10-30. ↑ "It's a Sad Day in This Neighborhood". Los Angeles Times. 2003-02-28. Retrieved 2018-10-30. ↑ "The Fred Rogers Trail". VisitPA | #visitPA. 2018-06-28. Retrieved 2018-10-30. ↑ 8.0 8.1 8.2 8.3 DeFranceso, Joyce (April 2003). "Remembering Fred Rogers: A Life Well-Lived: A look back at Fred Rogers' life". Pittsburgh Magazine. Archived from the original on January 3, 2005. Retrieved July 30, 2010. ↑ "7 items that tell the story of Mister Rogers, America's favorite neighbor". Entertainment Weekly. 2018-06-09. Retrieved 2018-10-20. ↑ 10.0 10.1 Comm, Joseph A. (February 2, 2015). Legendary Locals of Latrobe. Arcadia Publishing. ↑ "'Mister Rogers' to give Dartmouth Commencement Address". Dartmouth News. Dartmouth College Office of Public Affairs. May 2, 2002. Archived from the original on October 13, 2007. Retrieved July 30, 2010. ↑ Davis, Bobby (Summer 2003). "Fred McFeely Rogers". The Rollins Alumni Record. pp. 20–23. Archived from the original on July 20, 2011. Retrieved July 30, 2010. ↑ Vancheri, Barbara (December 25, 2003). "As promised, Joanne Rogers is doing 'fine'". Pittsburgh Post-Gazette. Archived from the original on December 22, 2017. Retrieved December 22, 2017. ↑ "Fred McFeely Rogers". UXL Newsmakers (2005). 2005. Archived from the original on September 24, 2008. Retrieved December 13, 2007 – via Find Articles. ↑ "Remembering Mr. Rogers". Presbyterian Historical Society. Retrieved November 2, 2018. ↑ Rodgers-Melnick, Ann (May 4, 2003). "Liberal pastor retires after long run in city". Pittsburgh Post-Gazette. Retrieved July 30, 2010. ↑ 18.0 18.1 Junod, Tom (November 1998). "Can You Say ... 'Hero'?". Esquire. Archived from the original on March 1, 2003. Retrieved July 30, 2010. ↑ Millman, Joyce (August 10, 1999). "Salon Brilliant Careers: Fred Rogers". Salon. Archived from the original on December 18, 2010. Retrieved July 30, 2010. ↑ Obis, Paul (November 1983). "America's Favorite Neighbor". Vegetarian Times. pp. 22–26. ↑ "In the Land of Make Believe, The Real Mister Rogers". The Washington Post. 1982-11-18. Retrieved 2018-10-20. ↑ 23.0 23.1 Tiech, John (July 17, 2012). Pittsburgh Film History: On Set in the Steel City. Arcadia Publishing. ↑ Schultz, Mike. "Sylvania Award". uv201.com. Retrieved July 30, 2010. ↑ "Broadcast pioneer Josie Carey was there from the start". Pittsburgh Gazette. March 27, 2004. Retrieved November 2, 2018. ↑ 26.0 26.1 "Fred Rogers Biography". ↑ Flecker, Sally Ann; Judkis, Jim. "When Fred Met Margaret - University of Pittsburgh". Pitt Med. Retrieved 2018-10-26. ↑ Broughton, I. (1986). Producers on Producing: The Making of Film and Television. McFarland classics. McFarland. p. 51. ISBN 978-0-7864-1207-5. Retrieved 2018-10-28. ↑ Williams, Suzanne. "Fred McFeely Rogers". museum.tv. The Museum of Broadcast Communications. Retrieved July 30, 2010. ↑ "Mister Rogers' Neighborhood and Beyond". Fred Rogers Center for Early Learning & Children's Media. Retrieved 2018-10-28. ↑ Jackson, K.M. ; Emmanuel, S.M. (2016). Revisiting Mister Rogers' Neighborhood: Essays on Lessons About Self and Community. McFarland, Incorporated, Publishers. p. 33. ISBN 978-0-7864-7296-3. Retrieved 2018-10-28. ↑ "How Mr. Rogers and Mr. Dressup's road trip from Pittsburgh to Toronto changed children's television forever". National Post. 2018-07-11. Retrieved 2018-10-26. ↑ Bertram, Colin (2018-10-26). "How Fred Rogers Changed Children's Television". Biography. Retrieved 2018-10-26. ↑ "Fred Rogers Biography". Fred Rogers Productions. 1928-03-20. Retrieved 2018-10-26. ↑ "Filming Mister Rogers' Neighborhood". Johnny Costa Pittsburgh's Legendary Jazz Pianist. Retrieved 2018-10-30. ↑ Hart, Ron (1968-02-19). "The Music of Mister Rogers' Neighborhood and Johnny Costa". JazzTimes. Retrieved 2018-10-30. ↑ "Mr. Rogers says goodbye -- for now". CNN. August 31, 2001. Retrieved November 2, 2018. ↑ 38.0 38.1 38.2 "Fred Rogers". Television Academy Interviews. 2018-01-01. Retrieved 2018-10-31. ↑ "DPTV celebrates 50th anniversary of 'Mr. Rogers'". Detroit News. 2018-02-23. Retrieved 2018-10-30. ↑ "100 Billionth Crayola Crayon". Fred Rogers Center for Early Learning & Children's Media. Retrieved 2018-10-31. ↑ Collins, M.; Kimmel, M.M. (1997). Mister Rogers Neighborhood: Children Television And Fred Rogers. University of Pittsburgh Press. ISBN 978-0-8229-8008-7. Retrieved 2018-10-30. ↑ 42.0 42.1 Rogers, F. (1996). Dear Mr. Rogers, Does It Ever Rain in Your Neighborhood? : Letters to Mr. Rogers. Penguin Publishing Group. ISBN 978-1-101-16169-2. Retrieved 2018-10-30. ↑ "WATCH: This Is Why We Will Always Love Mr. Rogers". HuffPost. 2013-04-10. Retrieved 2018-10-30. ↑ "Mister Rogers' Neighborhood Credit Videos". Retro Junk. Retrieved 2018-10-26. ↑ 45.0 45.1 Owen, Rob (November 12, 2000). "There goes the Neighborhood: Mister Rogers will make last episodes of show in December". Pittsburgh Post-Gazette Magazine. Retrieved March 20, 2011. ↑ 46.0 46.1 "The Music of Mister Rogers". Pittsburgh Gazette. February 22, 2018. Retrieved November 2, 2018. ↑ "WOUB-HD to Air 'Mr. Rogers: It's You I Like' March 6". WOUB Digital. 2018-03-02. Retrieved 2018-10-28. ↑ Meek, Tom (2018-06-05). "'Won't You Be My Neighbor?' Frames Mr. Rogers As A Man On A Mission". WBUR. Retrieved 2018-10-28. ↑ 49.0 49.1 Blickley, Leigh (2018-06-08). "The Gay 'Ghetto Boy' Who Bonded With Mister Rogers And Changed The Neighborhood". HuffPost. Retrieved 2018-10-28. ↑ 50.0 50.1 "How 'Mister Rogers' Neighborhood' Championed Children With Disabilities". Guideposts. 2018-10-15. Retrieved 2018-10-30. ↑ 51.0 51.1 "Obituary: Jeffrey Erlanger / Quadriplegic who endeared himself to Mister Rogers". Pittsburgh Gazette. June 14, 2007. Retrieved November 1, 2018. ↑ "Remembering Mr. Rogers, a True-Life 'Helper' When the World Still Needs One". Entertainment Weekly. Retrieved 2018-03-08. ↑ Jackson, K.M. ; Emmanuel, S.M. (2016). Revisiting Mister Rogers' Neighborhood: Essays on Lessons About Self and Community. McFarland, Incorporated, Publishers. p. 27. ISBN 978-0-7864-7296-3. Retrieved October 31, 2018. ↑ "The surprising success - and faith - of Mister Rogers and 'Won't You Be My Neighbor?'". The Salt Lake Tribune. 2018-07-13. Retrieved 2018-10-30. ↑ 55.0 55.1 "PBS Public Service Announcement with mister rogers : NeighborhoodVideo : Free Download, Borrow, and Streaming : Internet Archive". Internet Archive. 2017-10-17. Retrieved 2018-10-26. ↑ 56.0 56.1 "Mr. Rogers' words of comfort revived in wake of tragedy". Pittsburgh Post-Gazette. 2012-12-18. Retrieved 2018-10-28. ↑ "Why Mister Rogers' Plea To 'Look For The Helpers' Still Resonates Today". HuffPost. 2018-06-08. Retrieved 2018-10-31. ↑ 59.0 59.1 59.2 59.3 59.4 59.5 "Mister Rogers defending PBS to the US Senate". June 29, 2007. Retrieved September 1, 2016 – via YouTube. ↑ 60.0 60.1 "Fred Rogers Beyond the Neighborhood: Senate Committee Hearing". Fred Rogers Center. 1969. Archived from the original on June 17, 2012. Retrieved May 27, 2014. ↑ 61.0 61.1 61.2 61.3 "The Court Case That Almost Made It Illegal to Tape TV Shows". The Atlantic. January 10, 2012. Retrieved November 2, 2018. ↑ 62.0 62.1 "Sony Corp. of America v. Universal City Studios, Inc., 464 U.S. 417 (1984)". Supreme Court of the United States of America. 1984. Retrieved July 30, 2010. ↑ "Fred Rogers Moves into a New Neighborhood—and So Does His Rebellious Son". People. 1978-05-15. Retrieved 2018-10-26. ↑ 64.0 64.1 Liebman, Lisa (2018-06-08). "11 Delightful Things We Learn About Mr. Rogers in Won't You Be My Neighbor?". Vulture. Retrieved 2018-10-26. ↑ Roddy, Dennis (March 1, 2003). "Fred Rogers kept it simple, and elegantly so". Pittsburgh Post-Gazette. Retrieved 2007-12-12. ↑ Millman, Joyce (August 10, 1999). "Salon Brilliant Careers: Fred Rogers". Salon. Retrieved July 30, 2010. ↑ "Legacy of Fred Rogers". Retrieved September 21, 2014. ↑ Emery, David (November 26, 2011). "Mr. Rogers Was a Marine Sniper / Navy SEAL?". Urbanlegends.about.com. Retrieved December 22, 2011. ↑ "Mr. Rogers Was a Sniper in Vietnam-Fiction!". Truthorfiction.com. Retrieved December 22, 2011. ↑ "Won't You Be My Fiend?". snopes.com. August 7, 2007. Retrieved December 22, 2011. ↑ "Saint Fred". The Atlantic. November 22, 2015. Retrieved January 8, 2019. ↑ Maxwell King (4 September 2018). The Good Neighbor: The Life and Work of Fred Rogers. ABRAMS. pp. 208, 379. ISBN 978-1-68335-349-2. ↑ Ermac, Raffy (March 5, 2019). "Is Mister Rogers Our New Bisexual Icon?". Pride.com. Retrieved March 5, 2019. ↑ "Mister Rogers Shows Us How Crayons Are Made". South Dakota Public Broadcasting. February 25, 2015. Retrieved November 2, 2018. ↑ Everhart, Karen (March 10, 2003). 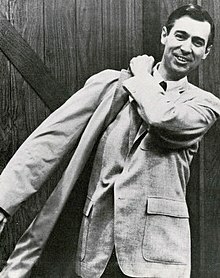 "Fred Rogers, 1928–2003". Current. Retrieved July 30, 2010. ↑ "Grand Marshal Slide Show Main". Tournament of Roses. 2004. Retrieved February 26, 2010. ↑ 83.0 83.1 83.2 Lewis, Daniel (February 28, 2003). Fred Rogers, Host of 'Mister Rogers' Neighborhood,' Dies at 74, The New York Times. Retrieved January 9, 2011. ↑ "The Saintliness of Fred Rogers". USCatholic.org. Retrieved November 2, 2018. ↑ 85.0 85.1 85.2 "The Two Freds: When Phelps Protested Mr. Rogers's Memorial". The New Yorker. March 20, 2014. Retrieved November 2, 2018. ↑ 86.0 86.1 86.2 "Pittsburgh Bids Farewell to Fred Rogers with Moving Public Tribute". May 4, 2003. Retrieved November 2, 2018. ↑ King, M. (2018). The Good Neighbor: The Life and Work of Fred Rogers. ABRAMS. p. 443. ISBN 978-1-68335-349-2. Retrieved 2018-10-28. ↑ 88.0 88.1 "Remarks on Presenting the Presidential Medal of Freedom". Presidency.UCSB.edu. Retrieved November 2, 2018. ↑ "Bill Text – 108th Congress (2003–2004) – S.CON.RES.16.ATS". THOMAS. Library of Congress. March 5, 2003. Archived from the original on July 18, 2012. Retrieved July 30, 2010. ↑ "Bill Text – 108th Congress (2003–2004) – H.RES.111.EH". THOMAS. Library of Congress. March 4, 2003. Retrieved July 30, 2010. ↑ 92.0 92.1 "Wear a sweater, honor Mr. Rogers". Today. February 27, 2008. Retrieved July 19, 2016. ↑ 26858 Misterrogers (1993 FR), NASA. Retrieved January 9, 2011. ↑ Plunkett, Chuck (May 2, 2003). Mister Rogers' star status now reaches heavenly proportions Archived March 16, 2012, at the Wayback Machine, Pittsburgh Tribune Review. Retrieved January 9, 2011. ↑ "Celebrating Mister Rogers". Google Doodle. Retrieved October 30, 2018. ↑ 104.0 104.1 Pressman, Aaron (2018-10-24). 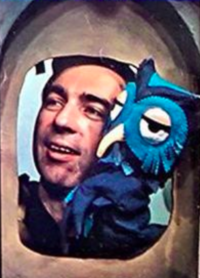 "Mister Rogers Stars in His First TV Commercial—For Google". Fortune. Retrieved 2018-10-25. This page was last changed on 21 March 2019, at 21:00.